I have some more signed cards to post on from Spring Training but I haven't gotten a chance to get them scanned yet. Same with a few packages from other bloggers that have came recently. I'll try to get those up soon. 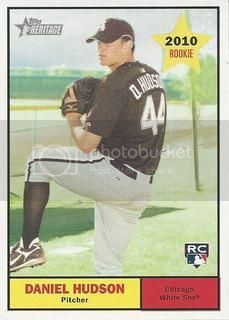 I did have this awesome Daniel Hudson rookie card from the 2010 Topps Heritage set scanned and ready to go. 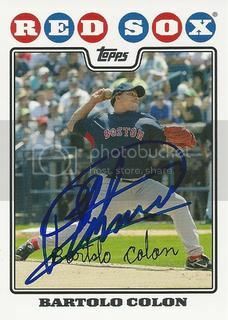 Back in December of 2010 we picked up a signed copy of Ramon Castro's 2008 Topps Gold Border Parallel. Pretty great except we didn't have his base card yet. Ramon is a non-roster invitee for the Dodgers this year and he signed his base card for us at a Spring Training practice last week. I'm glad to be able to cross this one off the list. 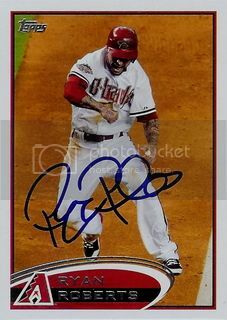 I doubt anyone was excited as I was when I found out the Diamondbacks had signed Eric Hinske. Not that I'm a big Hinske fan or anything. I just really wanted to get his card from the 2008 Topps Update & Highlights set signed. The other day I went over to Salt River Fields to see Eric and the D-Backs and the 2002 American League Rookie of the Year didn't disappoint. Thanks, Eric! As March draws closer, it's time for fantasy baseball! In addition to my long-time league I have with a few of my friends, I've signed up for two blogger leagues. One of my favorite blogs, Once a Cub, is trying to kick off a 2013 Fantasy Baseball League. It will be a standard 12 team Yahoo H2H league. For a $15 buy in you'll have a chance to win a ton of blasters. Check out the details here. Brian from 30-YOC is bringing back his Roto league for 2013. This one's free to join and there are only a few spots remaining. Check it out here. Join one or both and have the enjoyment of beating me. Despite playing for as long as I can remember, I'm horrible at fantasy baseball. After previously playing for the Diamondbacks for parts of five seasons, including the World Series Championship team in 2001, Rod Barajas is back in the desert. He is battling it out with Wil Nieves to be our backup catcher. 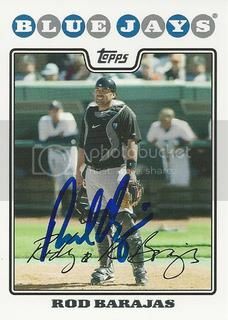 Rod signed his card from the 2008 Topps Updates & Highlights set for us over at Salt River Fields last weekend. 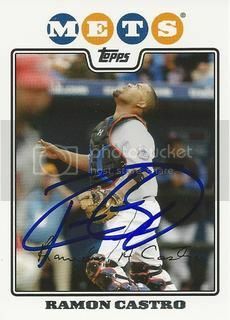 It's nice to have some new signed 2008 Topps cards to blog about. Next up is two-time All-Star and 2005 American League Cy Young award winner, Bartolo Colon. I remember trying to get Bartolo's autograph once before when he was on the Angels. He almost ran us over with his car in the parking lot. A few years have passed and this time my experience was completely different. On the day I went over to the A's camp, Bartolo took a seat on the bleachers and signed for everyone who asked. Totally awesome. 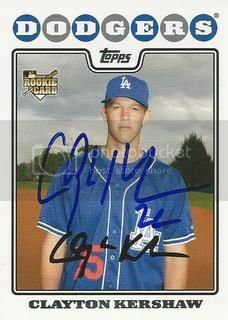 Earlier this week two-time All-Star and the 2011 National League Cy Young award winner, Clayton Kershaw, signed his rookie card for our 2008 Topps set. I made my first ever trip to Camelback Ranch for a Dodgers Spring Training practice. Man, the crowd was big. I mean I get it. They have tons of stars and Sandy Koufax was there too so that definitely didn't help. I fought hard to come home with a few signed cards. This one is by far my favorite. Not a bad way to start off Spring Training 2013. Check back tomorrow for another former Cy Young award winner. I went to Salt River Fields over the weekend. My wife, son, and I went out to see the D-Backs on Sunday and we went home with a few autographs. 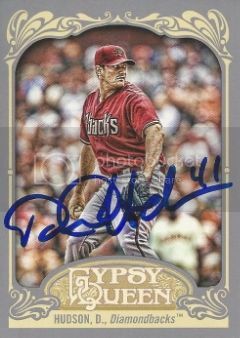 My wife had Daniel Hudson sign this 2012 Topps Gypsy Queen for me because she's awesome. 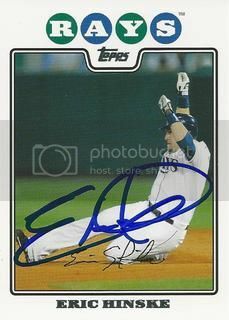 I've gotten a few 2008 Topps cards signed so far this Spring too. Check back tomorrow to see what we got. Of all the players we met, my favorite was Daniel Hudson. Big surprise, right? Daniel signed a few cards for us including this 2012 Topps Archives. In our last post I hinted that I went to Salt River Fields over the weekend. My wife, son, and I went out to see the D-Backs on Sunday and we went home with a few autographs. 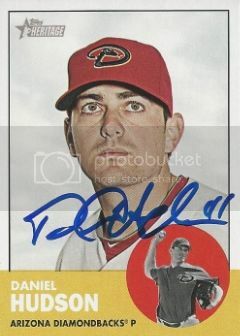 Daniel signed a few cards for us including this 2012 Topps Heritage. 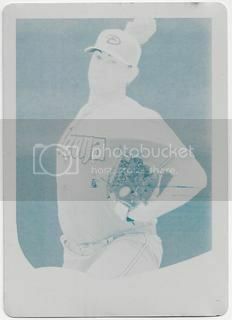 I finally got my first Daniel Hudson Printing Plate. It turns out this guy has been buying most of them up. This one's pretty cool. It's from the 2013 Topps set and is the cyan plate. I'm not crazy about these but I felt like I had to have one for my Huddy collection. I feel like I got a pretty good deal. A second plate sold for $10 more than I paid for this one just a few days later. Any guesses as to who won it? Probably this guy. I don't think this guy was out at Salt River Fields yesterday and I don't think this guy met Daniel Hudson. Scans coming soon. 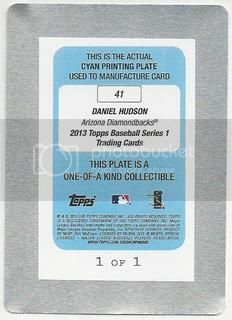 I haven't gotten a single Daniel Hudson card in the packs of 2013 Topps that I've bought so far. I still don't have his base card but I've found a few others on the secondary market. Here's his gold border parallel. The most classic of all parallels. This one will be around long after the camo, pink, and emerald have lost their novelty. Here's his red border parallel from Target's retail packs. I like this one more than the blue. The red border always looks good with the D-Backs colors. Here's his blue border parallel from Wal-Mart's retail packs. One of the great things about the Diamondbacks Fan Fest is they have kids only autograph tables. The lines weren't too bad so I talked my son into leaving the play area with the inflatable bounce houses just long enough to get an autograph from D-Backs manager, Kirk Gibson. Gibby signed his 2001 Fleer Greats of the Game card for us. This is my favorite Greats of the Game set. 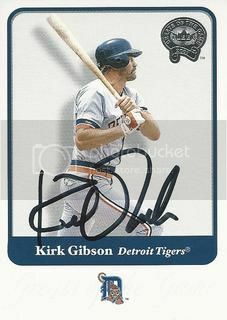 After I explained to my son that Kirk Gibson was Diamondbacks coach kind of like the coach of his t-ball team he thought it was pretty cool. Hopefully he'll still think so in a few years because this is the first baseball card that he's ever gotten signed all by himself. 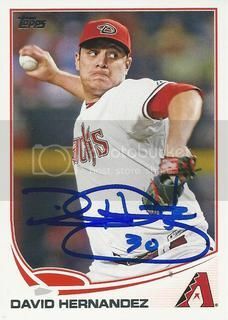 I missed out on getting Patrick Corbin to sign a card at the signing I went to last Friday. 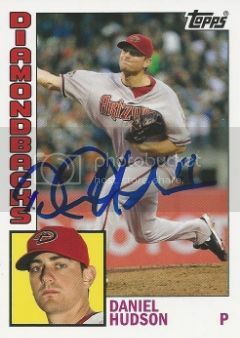 We were able to get Patrick to sign his 2012 Topps card at the Diamondbacks Fan Fest. I like Patrick. He's one of the D-Backs many options for a fifth starter this year. Even if he doesn't make the team out of Spring Training, I wouldn't be surprised to see him throw quite a few innings with the big club before the year is over. 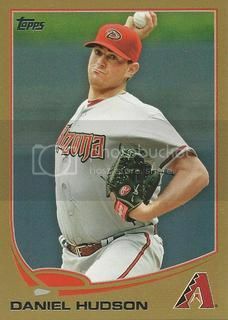 The next autograph ticket I bought for Diamondbacks Fan Fest was of starting pitcher, Trevor Cahill. I got Trevor's autograph last year but it was on an A's card. He has plenty of D-Backs cards to choose from now. 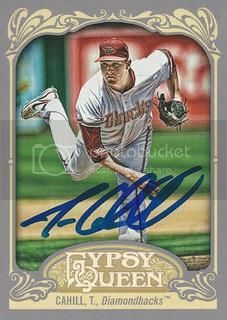 I went with this 2012 Topps Gypsy Queen. After seeing the signed version, I stand by my choice. It looks great. Saturday was the annual Diamondbacks Fan Fest. This year was a little different for me. The biggest change was the policy for the autograph tickets. This year the sessions were broken up into three groups. The early sessions were available in an online presale only for season ticket holders. The late sessions were available to everyone in an online presale and the middle session was only available in person on Saturday morning. Surprisingly this worked to my advantage. My son had a t-ball game that morning so there was no way I could get down to Chase Field super early like I usually do. Thanks to the online presale I was able to purchase tickets for a few of the autograph tables and I didn't have to hurry downtown. The table that I was most excited for had Tyler Skaggs and Cliff Pennington. For my $5 donation I was able to get Tyler to sign his 2013 Topps card. Last Friday, I headed over to a signing with a few Diamondbacks players. I met up with Dan from It's Like Having My Own Card Shop and Joe from Hello Victory! 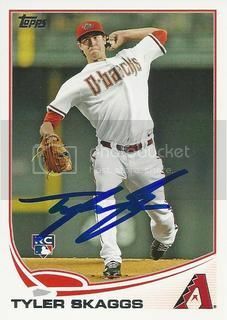 D-Backs reliever, David Hernandez, signed his new 2013 Topps card for me. This was the first time that I had ever met David. I've been a fan of his since he came to Arizona from Baltimore. I didn't get David's card out of the packs of 2013 Topps but Brian from 30-Year Old Cardboard sent me the D-Backs he pulled. Luckily Hernandez was one of them. Thanks, Brian! I found out a few days in advance that Adam Eaton was going to be at this signing. 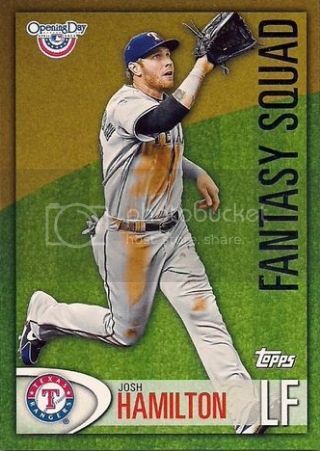 I didn't have his new 2013 Topps card so I had to overpay for one on eBay. I'm glad I did. 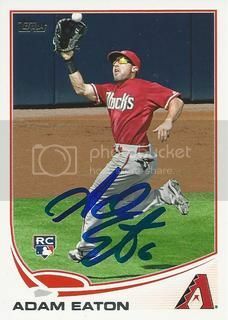 It turns out that my 2013 Topps card was the first one that Adam had ever signed. Now that didn't last for long since Dan was in line right behind me and he had him sign one too. For that ten seconds or less I had the only 2013 Topps card in the world that was signed by Adam. Miguel Montero, Josh Collmenter, Adam Eaton, and David Hernandez were all scheduled to attend. For unknown reasons Montero was replaced by Patrick Corbin. I didn't bring any Corbin stuff with me so that was kind of disappointing. At least they had cool freebie photos available. I didn't scan those but you can see the ones Dan got here and what Joe got here. I had a good time making some new friends and went home with a few signed cards. 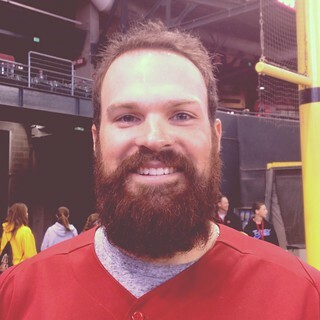 First up is D-Backs long reliever, Josh Collmenter. 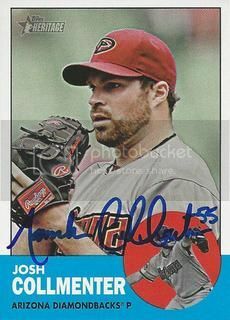 Josh signed his 2012 Topps Heritage card for me. Collmenter seems like a really nice guy. He's rocking a pretty killer beard right now too. Check it out. Happy Super Bowl Sunday, everybody! I don't care too much for the NFL these days outside of beating my friends at fantasy football. I figured today was an appropriate day for a football card post. 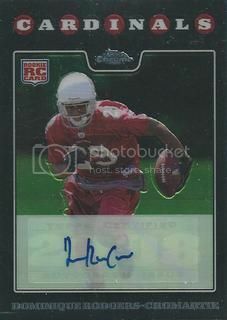 I found this Dominique Rodgers-Chomartie certified autograph from the 2008 Topps Chrome set in a box around the holidays. I don't remember when I bought it but it must have been before we started this blog. DRC left the desert in the Kevin Kolb trade. 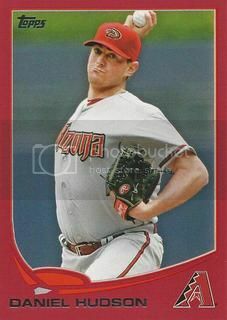 Yah let's not talk about that deal and just enjoy this addition to our 2008 Topps collection. 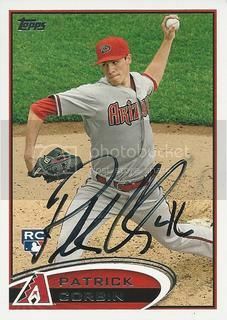 Here's another card I got signed during Spring Training 2012. This time last year I was excited to see what Ryan Roberts was going to do during the upcoming season like a lot of other Diamondbacks fans. He was coming off a career year in 2011 but didn't quite live up to the new, lofty expectations. Ryan was super nice when I met him. He took time and signed for everyone who asked and was very friendly the entire time. Ryan is now in Tampa with the Rays but Tatman will always have a special place in D-Backs history.